Global Competiveness, Technology Advancement and Consumer Welfare have necessitated competition law to be taken seriously. Increasingly, greater number of organisations and individuals – both in Government and Private spheres – now need to acquire knowledge on competition law. 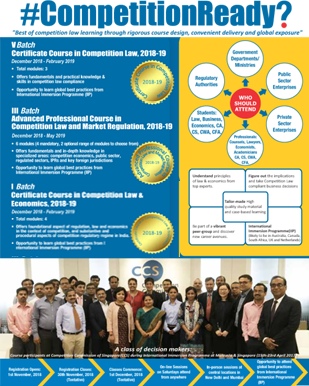 These courses – Certificate Courses and Advanced Professional Course - are uniquely designed and developed by IICA as shorter, flexible and focused option to meet specific professional needs of policy makers, regulators, business executives, lawyers, economists, CS, CAs and other professionals. These Courses have now emerged as the gold standard in the area of competition law & market regulation on the merits of: rigorous course content and focus on specialised professional needs and easy of delivery. The hybrid mode of delivery – involving brief in-person sessions and regular online sessions on weekends – allows the participants to attend the course along with their professional pursuits. The modules - written and reviewed by top experts - offer clear and actionable knowledge. Similarly, interactions on live and past cases and practical situations with leading competition law experts from law firms and Government help the participants seek clarity on complex business and policy issues. How does Competition Act, 2002, along with the existing sector regulations, affect business decisions of your organisation? What precautions should you take while dealing with your suppliers, distributors, competitors and other market agents? Also, what are the lawful ways to gather market Intelligence? In the event of JVs, consolidation/merger & acquisitions, what are the mandatory requirements under Competition Act, 2002? Similarly, what are the precautions to be taken in terms of information exchange between parties, usage of clean teams etc? Does your organisation has a framework and capacity to take competition law compliant business decisions and acquire competitive advantage?